NASA managers have approved funding elements to allow for a plan to leave the Orbiter Boom Sensor System (OBSS) as a permanent fixture on the International Space Station (ISS). 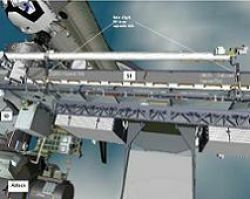 The 50 foot robotic arm would be used as a EVA crew platform for maintenance activities by ISS crewmembers. The plan, which would result in the final shuttle mission returning home without the OBSS, was previously suggested for STS-133 (Contingency Logistic Flight) – the final shuttle mission manifested for the shuttle program. However, the shuttle program is ‘very close’ to being extended by several missions, with STS-134/AMS already added to the latest “planning” document by the Flight Assignment Working Group (FAWG) – article to follow this week. Regardless of when the OBSS would be left behind by a shuttle mission, its requirements for Late Inspections on that particular mission would follow the plan utilized during STS-123. Due to clearance issues in the Payload Bay with STS-124’s Kibo Laboratory, STS-123 carried out a docked Late Inspection – which proved to be a successful technique – before berthing the OBSS on the outside of the orbital outpost (S1 Truss). That again would be the plan with adding the OBSS to the Station on a permanent basis, allowing its use by ISS crewmembers, which would be especially useful during Expedition EVAs. “Board approved the costing to enable leaving the OBSS on the S0 truss on a permanent basis,” noted this week’s MOD 8th Floor News memo on L2. “It provides funding to provide an EVA change out of the forward Shuttle grapple fixture with a SSRMS (Space Station Remote Manipulator System) compatible PDGF (Power Data Grapple Fixture. “This allows the SSRMS to grapple the OBSS at either the mid or fwd location. Also, this implementation does not preclude adding camera equipment in the future if desired. A good example of the OBSS’ ability to aid EVA work on the ISS was seen during Scott Parazynski’s epic EVA on STS-120, when he rode a combination of the OBSS and the SSRMS to carry out repair work on the P6 4B Solar Array. Parazynski would not have been able to reach the array, had it not been for the reach provided to him by both arms. The OBSS was added to the Shuttle Program as a Return To Flight addition of enabling a full inspection of the orbiter’s TPS (Thermal Protection System) after ascent (Flight Day 2) and post undocking (Late Inspections). The OBSS includes an instrumentation package that consists of visual imaging equipment, this includes the Laser Dynamic Range Imager (LDRI), and Neptec’s Laser Camera System (LCS). Since RTF, the OBSS has more than proved its worth, providing additional confidence in the health of the orbiters prior to re-entry. This was best seen during STS-118, when the OBSS was tasked with taking a closer look at a gouge on the underbelly of Endeavour. Thanks to unique imagery and data via the LCS – which included a 3D movie of the damage – engineers on the ground were able to clear the TPS for re-entry, a decision that proved to be fully justified by the lack of damage observed in post landing inspections. The cost of allowing the OBSS to be left on Station is understood to be around a $1m, which – compared to shipping it off to an exhibition – would more than pay for itself should ISS crewmembers require its use during maintenance work on the ISS. In other ISS robotic related news, the Dextre Special Purpose Dexterous Manipulator (SPDM) continues to be checked out ahead of its first major role on the ISS. Dextre was grounded during troubleshooting recently, when engineers identified a potential failure mode in the SPDM Power Switching Init (PSU). However, tests have shown the robot will be able to press forward with tasks scheduled for the Autumn. “The SPDM continues to be checked out by the mission control team in preparation for a R&R of a RPCM (Remote Power Control Module) in the fall,” added the expansive 8th Floor ISS update. “The team operated the Space Station Remote Manipulator System (SSRMS) and SPDM. “Operations included motion of the dexterous arm 2 shoulder roll joint, which had a hardware problem during STS-123 in March 2008. Engineers were able to correct this with a software update in the MSS 5.2 load which was uplinked in December.